When a paper machine breaks down, one of our customers may be losing anywhere from $5,000 to $50,000 an hour. That's why so many paper companies depend on our quality, rapid-response machining for the parts they need to get them up and running again. Pierce Machine Company is a full-service machine shop, with capabilities including machining, fabrication, assembly and test. Our state-of-the-art equipment and tooling enables us to meet the close tolerances required for the high-speed precision machines of today's manufacturers. 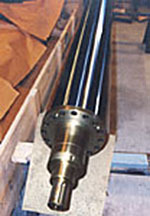 Our greatest strengths are lathe turning, CNC machining, fabrication and assembly. We also provide Blanchard grinding up to 42 inches, dynamic balancing, tooling, welding, drilling and prototype machining. Additional services include rubber covering of rolls, chrome plating, EDM, water jet cutting, heat-treating, NDT testing, and turnkey project management.